The authors of recent research published in the European Journal of Political Economy titled, “Support for free-market policies and reforms: Does the field of study influence students’ political attitudes?” used waves of survey data from German university students (n: >8000) to investigate how one’s field of study influenced their political beliefs. First, the researchers examined the student’s political attitudes towards their first semester at University. The results showed that students were generally more in favor of social democracy (progressivism) than of conservatism. They also found that those students who chose to study the social and natural sciences tended to be more progressive than those who did not, as they were more likely to favor the social democratic and Green parties (which would be considered left wing in America). So there was seemingly some self-selection of students into different fields of study based on their political beliefs. What is interesting, however, is how these students’ beliefs changed over their course of their time at University. The political preferences of medical and law students, shown in the graph above, did not change much over the course of their time at University, while engineering, humanities, social and natural science students shifted somewhat towards the Green Party. On the other hand, economics students saw considerable changes in their political preferences over the course of their studies. As shown below, economics students became much more likely to support the free market-oriented Liberal-democratic party after each semester. As noted in the abstract of the paper, “by the time of graduation, economics students are some 6.2 percentage points more likely than they were in their initial year of study to agree with free-market policy positions.” They were also more likely to support the conservatives and the Green Party, and less likely to support the Social democrats. The results held even after accounting for systematic changes in the sample that could have contaminated the results. 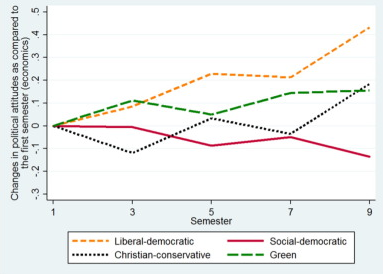 For example, if students who hold Liberal democratic views are more likely to survive their economics courses, then they would become better represented in the sample over time. To check against this, the authors excluded all students from the sample who declared to be not satisfied with the grades they obtained in their courses. “Since students who are satisfied with their grades are not likely to drop out of the program, we can pretty much rule out a survivor bias in this restricted sample,” they write. The results from this sample were “perfectly in line with their benchmark estimates,” suggesting no contamination. They also checked to see if students became more favorable to the Liberal-democratic party because their professors indoctrinated them into believing certain free market economics theories that the party supports. This was accomplished by asking German professors to rate University economics departments as left-wing, neutral, or right-wing. They found that students attending Universities considered right-wing were no more likely to become attached to classical liberalism than students at non-right wing Universities. “…economics students are [not] brainwashed or indoctrinated by their instructors. The available empirical evidence rather suggests that economics students acquire analytical tools that make them see the world in a different light,” they write.